On the Google Compute Engine (GCE) platform, the default logging support targets Stackdriver Logging, which is described in detail in the Logging With Stackdriver Logging. 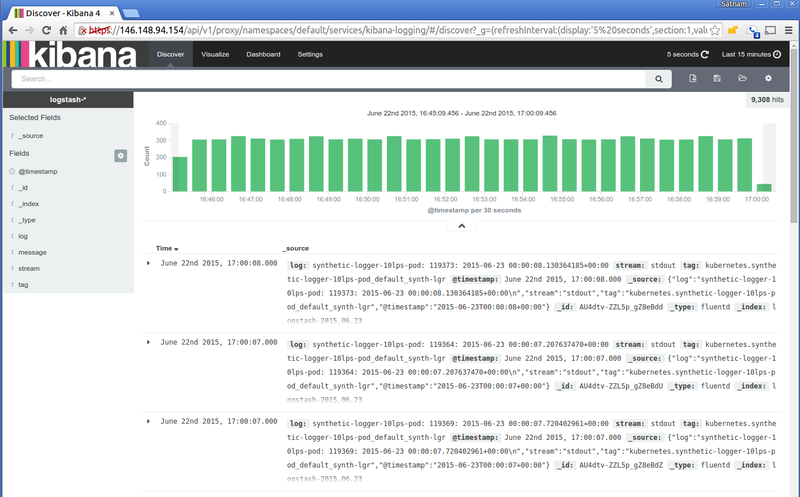 This article describes how to set up a cluster to ingest logs into Elasticsearch and view them using Kibana, as an alternative to Stackdriver Logging when running on GCE. Note: You cannot automatically deploy Elasticsearch and Kibana in the Kubernetes cluster hosted on Google Kubernetes Engine. You have to deploy them manually. You should also ensure that KUBE_ENABLE_NODE_LOGGING=true (which is the default for the GCE platform). The per-node Fluentd pods, the Elasticsearch pods, and the Kibana pods should all be running in the kube-system namespace soon after the cluster comes to life. The fluentd-elasticsearch pods gather logs from each node and send them to the elasticsearch-logging pods, which are part of a service named elasticsearch-logging. These Elasticsearch pods store the logs and expose them via a REST API. The kibana-logging pod provides a web UI for reading the logs stored in Elasticsearch, and is part of a service named kibana-logging. The Elasticsearch and Kibana services are both in the kube-system namespace and are not directly exposed via a publicly reachable IP address. To reach them, follow the instructions for Accessing services running in a cluster. You can now type Elasticsearch queries directly into the browser, if you’d like. See Elasticsearch’s documentation for more details on how to do so. Alternatively, you can view your cluster’s logs using Kibana (again using the instructions for accessing a service running in the cluster). The first time you visit the Kibana URL you will be presented with a page that asks you to configure your view of the ingested logs. Select the option for timeseries values and select @timestamp. On the following page select the Discover tab and then you should be able to see the ingested logs. You can set the refresh interval to 5 seconds to have the logs regularly refreshed. Kibana opens up all sorts of powerful options for exploring your logs! For some ideas on how to dig into it, check out Kibana’s documentation.